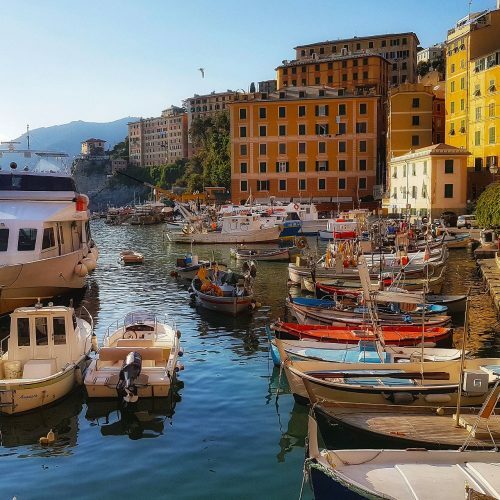 Liguria is known for some wonderful culinary specialties: trofie al pesto, the famous corkscrew pasta with bright green basil sauce; cheese-filled focaccia di Recco; and farinata, a tender savory pancake made with chickpea flour and baked in a wood-burning oven. But did you know that Liguria also has its own version of couscous? 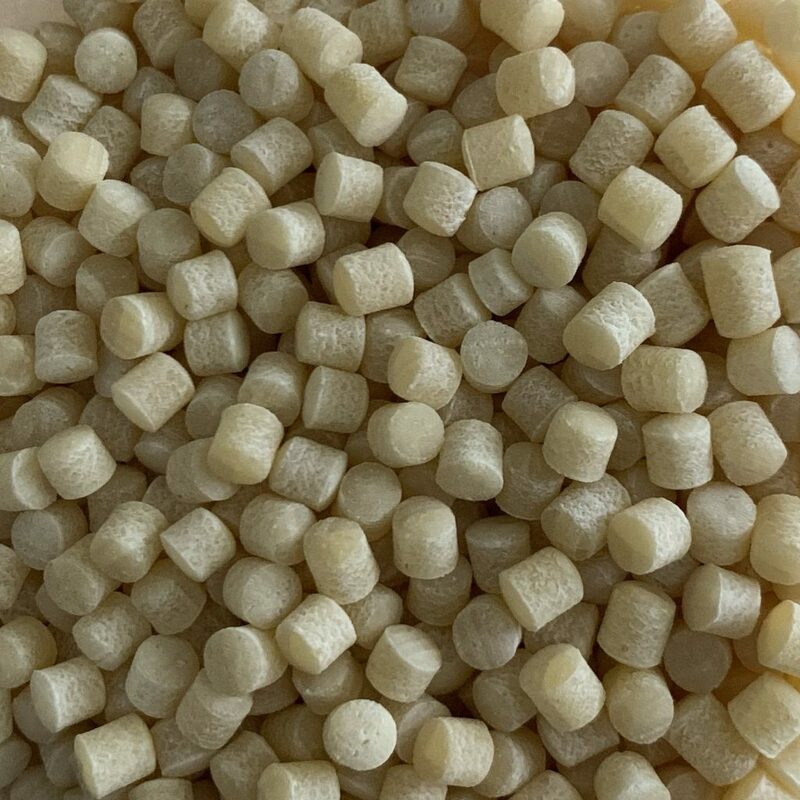 Meet scucuzzun, (pronounced “skoo-koo-ZOON”), a pellet-shaped pasta made from durum wheat and water that is similar to Sardinian fregola and Israeli couscous. It reminds me of a larger version of acini di pepe, one of my favorite pastina shapes, named for its resemblance to peppercorns. Last May, during my Beautiful Liguria-Domenica Cooks culinary tour, I came across packages of scucuzzun for sale in one of the food shops we visited. I was intrigued, so I purchased a package and brought it home to the U.S.
Pastificio Alta Valle Scrivia, a Genoese producer of scucuzzun and other pasta, traces scucuzzun’s beginnings to Ligurian settlers who traveled to Tunisia and Algeria in the 1500s and eventually adopted North African culinary traditions. In the following centuries, descendents of these settlers made their way to Sardegna, and also back to Liguria, bringing their couscous-making skills with them. Though, like couscous, scucuzzun was once made by hand, Genovese pasta manufacturers eventually began producing it mechanically using a torchio, a pasta press. The pasta is now made by extrusion, creating a uniform, cylindrical “pill” shape. In Liguria, scucuzzun is traditionally used for minestrone. But you can also use this versatile pasta in the same way that fregola and couscous are used – in pilaf-style dishes (especially with seafood), and in summer vegetable salads. The other evening, during a cold snap, I had an opportunity to open my package of scucuzzun to make winter minestrone. While my recipe is not strictly traditional, it is in keeping with the Ligurian tradition of healthful vegetable-based soups. 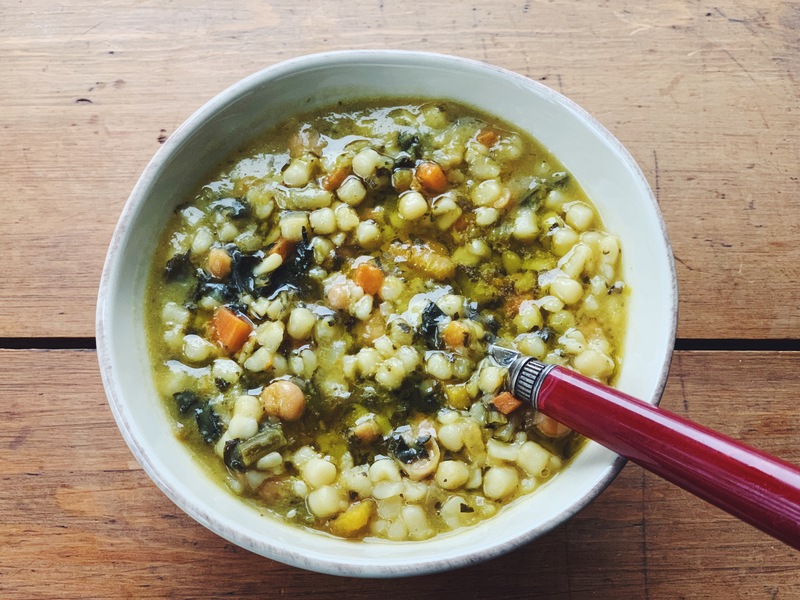 I added winter herbs from my garden for flavor, and chickpeas in place of the borlotti beans that are standard. And, because I had some on hand, I cut up a piece of kabocha squash and added that, too, for its gentle sweetness. In our May culinary tour, we are all about discovering Liguria’s delicious secrets, like scucuzzun. 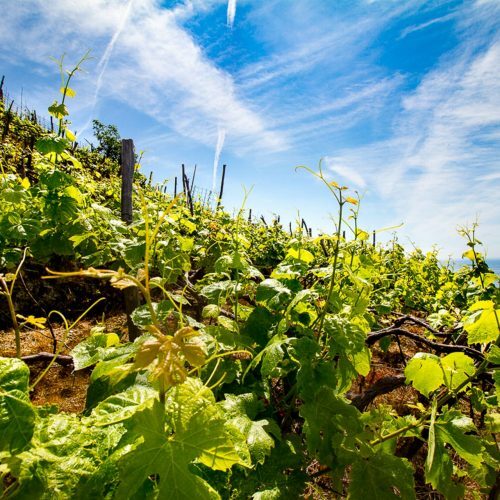 Maybe you would like to join us with the culinary tour in may 2019? For now, enjoy this recipe for minestrone with this special pasta. Heat 4 tablespoons (60 ml) oil in a large pot over gentle heat and stir in the carrots, celery, onion, and herbs. Cook on medium-low for 10 minutes, until the vegetables are softened. Add the potatoes and squash and cook, stirring often, for just a few minutes, until they begin to soften. Stir in the kale and chickpeas, and pour in ladleful of liquid from the chickpeas. Bring to a simmer, cover the pot, and cook gently until the potatoes and squash are almost tender, about 10 minutes. Turn up the heat and pour in 4 cups (1 L) broth or water. Add the Parmigiano rind to the pot and bring the liquid to a boil. Season lightly with salt and add a splash more olive oil to enrich the flavor of the soup as it cooks. Simmer gently, stirring from time to time, until all the vegetables are very soft. Use a spoon to mash a few pieces of potato and squash to make the soup thicker and creamier. Pour in 2 more cups (1/2 L) broth or water and bring to a boil. Stir in the scucuzzun and cover the pot partially with a lid. Let the soup boil gently for 15 to 20 minutes, or until the pasta is ready (it takes longer than usual to cook pasta in a thick soup). If necessary, add more broth or water to prevent the soup from becoming too thick. 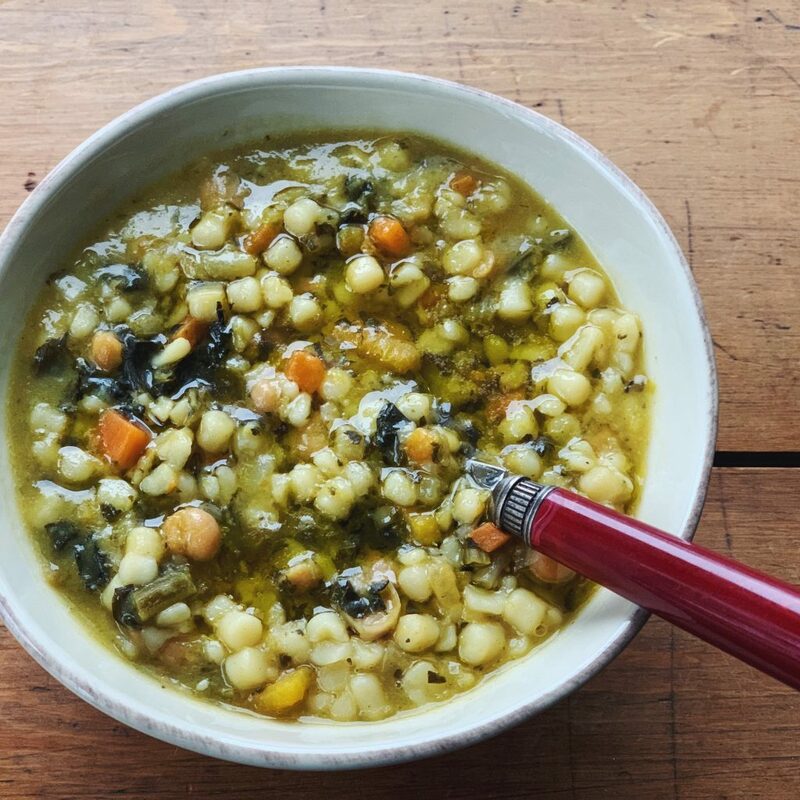 When the soup is done, ladle it into bowls and garnish each serving with a generous drizzle of olive oil.